Manolo Blahnik's first menswear boutique is now open in Burlington Arcade, London. 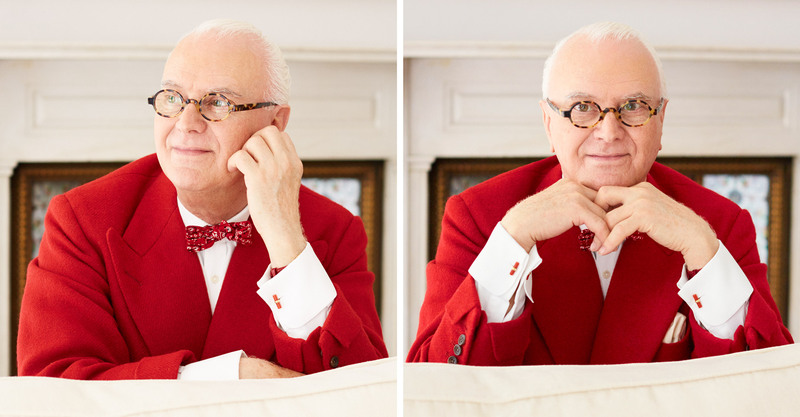 Mr. Blahnik, what kind of shoes are you wearing right now? Was there a very adventurous perception around men’s footwear at the time? Yes, the men’s footwear at the time was absolute freedom. We had lovely people in the mid-eighties like David Bowie who asked for three centimeter shoes and special things like that. I’ve been doing men’s shoes, maybe six or seven pairs a year for my entire career; and the ones we had, we sell. I realized that we had people asking in all our shops about men’s shoes, so I decided to buy the shop next door and do a men’s collection. I’m like that, I take decisions in seconds! But you know something? I was doing tweed last year for women, so I did tweed for men as well, and it was very successful, which I didn’t expect it to be. Well, people don’t want to change too much. Right now, everybody’s regimented. Everybody’s wearing the same bloody trainers. I saw these trainers from my friends at Balenciaga — the most horrific thing! (Laughs) I don’t want to be rude but I thought, “Good Lord, £1000? For rubber?” I saw a woman on the train in Paris, this lovely woman and I couldn’t stop staring at her. But she had on those Balenciaga trainers so I said, “You’ve got beautiful legs, but my dear lady, change those awful things.” I was so offended! I don’t have patience for stupid people in trainers. I’m really bad about these things! Do you think that these days, shoes have lost their social or cultural meaning? Everything comes in stages, and I think today, people want to show off what they’ve bought, anything expensive, brand names, things like that, which I don’t like at all. I like things to be beautifully made — but not in-your-face. I find that to be vulgar, £1000 trainers… To show what? They’re not beautiful. It appears that everything is ugly. What do you call this American term? “Fugly.” I read it in The New York Times the other day and I said, “Oh my God, what is that word?” (Laughs) But that is exactly what’s going on! As for the meaning of shoes, well… Sandals simply mean that you’re going to be in a country which is hot. You don’t have to show your status unless you live in some strange society, I don’t think people at the beach need to see your expensive shoes. Maybe shoes have simply become functional fashion. Functionality, maybe, that’s true. Perhaps it’s also about comfort: for instance, for men, you have a beautiful babouche from Morocco or slippers woven from palm leaves. That is kind of significant: men who want to be comfortable. It was the same with women in past centuries, mules were at one point shoes for women of easy virtue, they wore huge complicated dresses but comfortable shoes. People just get confused now; they think things have to be culturally relevant… Yes, trainers are culturally relevant, possibly a social signifier, but it’s not how I would like to see things going in the world. It doesn’t seem like you’re particularly interested in trends anyway. No, I never have been, actually. Not now or then! I was born like that, in fact, if I see too much of something, I change it. What is the point for all this kind of nonsense, young people wearing the same dresses, the same shoes? Everybody’s the same, and I just hate it. I think it’s awful. I like independence. I love the eccentrics. I think if you like something, buy it. Find your style and stick to it. Iris Apfel said that where style is concerned, you have to know who you are first, and then proceed from there, which is a lot of work. Exactly and most of the people they don’t want to do that because they see the social tribes, there’s too much Internet… They don’t even know who Brigitte Bardot was! There was a beautiful, beautiful picture by Richard Avedon of Brigitte Bardot, and I saw these two girls looking at it. And one of the girls, she said, “Oh, she’s beautiful, isn’t she? Who is she?” I almost strangled the poor child. (Laughs) Brigitte Bardot, the most incredible woman, she changed the way women wore their hair, Capri pants, little dresses in Gingham, ballerina shoes… And these people nowadays have a very short memory for things like that. Maybe I’m wrong, but you know, I’m old. Have you always been enchanted by shoes? Even as a boy? Yes. I remember I loved Barbara Stanwyck’s marabou mules in Double Indemnity! I remember also in the islands of Spain, the women would wear espadrilles, Catalonian espadrilles with a lot of laces around the ankle. Those are the first shoes that I remember — I was a boy! But then when I started designing, it was those awful platforms, very heavy. I never liked heavy shoes of any silhouette because even if you’re short, they make you look shorter! Then in the eighties, everybody was wearing high heels, which was ideal for me because I love high heels. But then they changed to something else. And now the changes are often so fast, so quick that you can’t even see what the change actually. So what changes do you hope to see in fashion? I just want to see women and men simply dressed beautifully. I saw a man the other day with a linen suit and linen shoes and I thought that was extraordinary. That was the maximal chic, to me, the maximal elegance. I think there needs to be a limit. People put too much in one shoe, too much fantasy, over-decorated, overdesigned… I think the best designers I’ve ever seen are the Scandinavian ones! They’re really pure, they have beautiful ideas and they execute them beautifully. And this is rare these days so in that sense, I’m completely living in the wrong time. I’ve been very fortunate, and I don’t know why, but my shoes don’t have a special time. I don’t do it with that in mind but it happens: timelessness. I have been absolutely gifted by that.